Looking for a lighter take on traditional fried chicken? 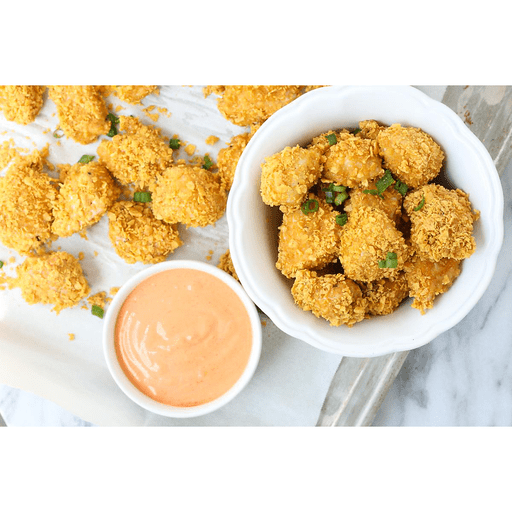 This Baked Popcorn Chicken recipe features corn flakes to give chicken a tasty crunch without the heavy breading. Try it with this simple sriracha mayo for an extra kick! 1. Preheat oven to 375°F. Line rimmed sheet pan with parchment paper. 1. Place chicken in a medium bowl. Sprinkle salt and pepper over chicken and drizzle with olive oil. Roll chicken in crushed corn flakes and place on sheet pan in a single layer. Spray chicken with olive oil and bake 10-12 minutes or until golden brown. 1. While chicken is cooking, mix mayonnaise and sriracha in a small bowl. 1. When chicken is done, garnish with green onions and serve with sriracha mayo. Calories 490, Total Fat 23g (Saturated 4g, Trans 0g), Cholesterol 175mg, Sodium 530mg, Total Carbohydrate 14g (Dietary Fiber 1g, Sugars 3g), Protein 53g, Vitamin A 10%, Vitamin C 10%, Calcium 2%, Iron 30% *Nutritional values are an approximation. Actual nutritional values may vary due to preparation techniques, variations related to suppliers, regional and seasonal differences, or rounding.